Test, mix or scoop skin care products with this disposable plastic crystalline wand. This disposable polystyrene boomerang spatula is ideal for scooping out a variety of cosmetic formulations for sampling or testing purposes. 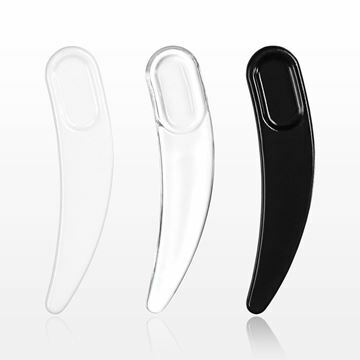 This mini disposable polystyrene boomerang spatula is ideal for scooping out a variety of cosmetic formulations for sampling or testing purposes. The unique shape and elegant design of this curved spoon spatula makes it the perfect companion to luxury brand packaging.